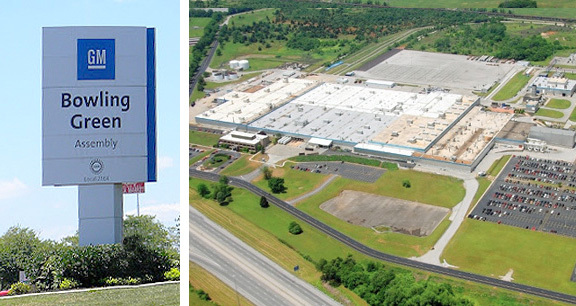 Project obstacles and solutions: In September 2015, the GM Corvette Assembly Plant in Bowling Green, Kentucky broke ground on a new 870,000 square foot paint shop. The massive facility adds 50% more space onto the current plant. The Bowling Green Plant is the lone GM plant that assembles the icon Corvette. Walbridge was selected as the general contractor for this project and they self-performed all of the concrete work. The Paint Shop included more than 200,000 square feet of concrete floors. The foundation floors were placed as continuous pours of over 1,200 yards per pour. Each of these pour times ranged from 11-12 hours in length. In this kind of concrete construction, there are three factors that have to be met in order to have a successful pour. The consistency of the concrete mix from one truck to the next has to be spot on. IMI QC/QA monitored each load of concrete to make sure there were no inconsistencies. The second factor is set time. Some of the largest pours happened during the coldest months of the year, which can greatly slow set times. Again, IMI QC/QA adjusted mix designs to speed up initial set times when needed. The third factor is the uninterrupted flow of concrete to the site. The largest of the continuous flow pours required over 130 deliveries. IMI plant personnel and drivers worked to make sure there was no break in these deliveries. Beyond the thick floors of the facility pit, IMI also supplied concrete that was pumped onto the elevated upper floors of the structure. In total, IMI supplied 37,000 yards of concrete for the new Paint Facility. GM plans to start using the paint facility by April 2017. For more information on continuous pours of concrete, contact the sales representative for the concrete plant nearest your location. Click here.